Złamania szyjki kości udowej od zawsze były i są trudnym wyzwaniem dla chirurga ortopedy, problemem osobistym dla chorego i jego rodziny, a także charakteryzują się wysokimi kosztami finansowymi i społecznymi. Częstość tego urazu określana jest nawet na 7% wszystkich złamań, a około 1/3 dotyczy osób w podeszłym wieku, tzn. powyżej 70 roku życia. W chwili obecnej złamanie szyjki kości udowej u chorego w podeszłym wieku należy uznać za wskazanie do leczenia operacyjnego, przy braku bezwzględnych przeciwwskazań ogólnych. Propagowane przez lata dążenie do ratowania naturalnego stawu biodrowego, czyli zespalanie złamania z próbą uzyskania zrostu kostnego, coraz częściej ustępuje miejsca nowoczesnej endoprotezoplastyce biodra. Postępowanie takie przyspiesza usprawnianie chorych, ich większą samodzielność, zmniejsza ryzyko konieczności przeprowadzenia powtórnych operacji w razie niepowodzenia osteosyntezy. Spośród metod endoprotezoplastyki stawu biodrowego do wyboru mamy endoprotezoplastykę połowiczą, bipolarną oraz całkowitą, a decyzję o wyborze leczenia podejmować należy indywidualnie dla każdego pacjenta na podstawie m.in. jego stanu ogólnego oraz zdolności do stosowania się do zaleceń pooperacyjnych (1). Femoral neck fractures have always been a great challenge for an orthopedic surgeon, a personal problem for the patient and his family, furthermore they are associated with high financial and social costs. The frequency of this trauma is ca. 7% of all fractures and about 1/3 concerns elderly people, i.e. over 70 years of age. Nowadays femoral neck fractures in elderly patients should be treated operatively, if no general contraindication present. Throughout the years efforts have been made to save the natural hip joint, what could be achieved by closed reduction and internal fixation of the fracture. At present this method is being replaced by modern hip alloplasty, resulting in faster rehabilitation of the patients and their greater postoperative independence. The choice among unipolar, bipolar or total allopasty of the hip should be individualized for each patient based on the patient’s general condition and his ability to comply with the postoperative instructions (1). Słowa kluczowe: złamanie szyjki kości udowej, zespolenie szyjki kości udowej, endoprotezoplastyka połowicza stawu biodrowego, endoprotezoplastyka bipolarna, endoprotezoplastyka totalna stawu biodrowego. Key words: femoral neck fractures, unipolar hip alloplasty, bipolar hip alloplasty, total hip alloplasty. Treatment of femoral neck fractures may be divided in surgical and non-surgical methods. In the past, non--surgical treatment was used far more frequently than it is now; functional methods were developed with use of the skeletal tractions, closed reduction of fractures with immobilization in hip plaster casts. However, such therapy methods are especially troublesome for elderly patients, and associated with risk of such complications as bedsores, urinary tract infections, respiratory tract infections, thromboembolic disease, and lack of the bone union. For this reason, non-surgical management is reserved for patients with absolute contraindications for surgical treatment and it is focused on creating a nonunion of the femoral neck. The patients require careful nursing, pain pharmacotherapy, frequent change in body position, placing them in a sitting position, and after receding of the acute pain phase (usually after approximately 2-3 weeks), they need gradual prolongation in attempts to keep them in a standing position with support of a walking frame with castors. Patients, whose general condition is suitable, are surgically treated. Surgical treatment methods include surgery that spares the hip joint, i.e. fracture fixation, and the joint arthroplasty, i.e. total hip arthroplasty. Reduction of the femoral neck fracture and internal fixation, despite the fact that it seems to be the treatment of choice, in elderly patients is associated with the risk of a high percentage of failures. Large forces transferred through the proximal part of the femur and small size of the proximal intra-articular element – regardless from the selected method of the fracture fixation require offloading of the operated limb within the post-operative period. Noncompliance results in destabilisation of the fixation. In a majority of over 70 year-old patients, we cannot rely on sufficient strength of the upper limbs, motoric coordination non compliance, to achieve complete offload the operated limb. The next factor adversely influencing treatment outcome after internal fixation of the femoral neck fracture is blood supply to the proximal bone fragment. The dominant volume of arterial blood nourishing the femoral head and the outcoming venous blood is transported through the vessels located at the surface of the femoral neck. In case of its fracture, the aforementioned vessels brake, and in the best case scenario, in undisplaced fractures, they are compressed by created intra-articular hematoma. Disturbance in circulation within the proximal bone fragment results in impaired union of the bone and leads to aseptic necrosis of the femoral head. In total, the percentage of the aforementioned complications exceeds 80% (2-4) (fig. 1). Fig. 1. Fracture of the left femoral neck – condition following fixation with three cannulated screws (radiogram on the left side). After removal of the fixing material, the presence of nonunion of the femoral head is established with aseptic necrosis of the femoral head (radiogram on the right side). Poor outcome of treatment of femoral neck fractures with fixation and attempts to obtain bone union in elderly patients induced orthopaedists to search for other solutions. In 1952, Austin Moore, as one of the pioneers, proposed primary hemiarthroplasty (5, 6). A one-piece implant, which he invented, embedded without the use of surgical cement, and not requiring surgical intervention within the area of the acetabulum, has been used until now. The unquestionable advantage of the Austin Moore prosthesis (A-M prosthesis) is the easy procedure, short duration of the operation, insignificant bloodloss and a low risk of joint dislocation as well as the low cost of the procedure. The basic disadvantages include rapidly progressing damage of the articular cartilage of the acetabulum, which results in pain, and protrusion of the endoprosthesis head. The listed imperfections of the Austin Moore prosthesis caused it’s current occasional use: in elderly patients with low mobility, as it allows painless nursing and walking within a small area (fig. 2). Fig. 2. The left hip joint: 5 years after Austin Moore hemiarthroplasty – visible protrusion of the endoprosthesis head. Hip pain resulted in realloplasty; due to the patient’s age, an implant on surgical cement was used. Bipolar hemiarthroplasty was a milestone in hip arthroplasty performed in middle-aged and elderly patients with femoral neck fractures. Due to the characteristic structure of the socket, which replaced the femoral head, movement was limited between the endoprosthesis surface and the acetabulum, limiting pain. At the same time, all advantages of hip hemiarthroplasty were maintained: easy and fast surgery, high stability of the hip joint, moderate cost of the procedure, possibility of early weight bearing by operated limb and in addition, easy surgical conversion to total hip arthroplasty, if necessary (fig. 3). Fig. 3. 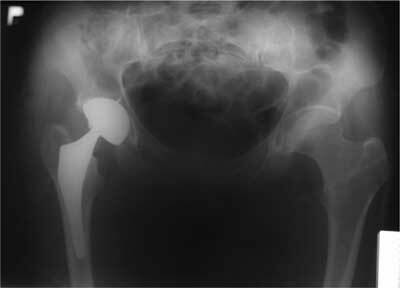 Bipolar endoprosthesis, where movement occurs between the osseous acetabulum and artificial hip socket – endoprosthesis head. On the right – postoperative radiogram of the hip joint. Total hip arthroplasty, i.e. procedures including implantation both femoral and the acetabular element, is recognized as the most durable; elements of modern, total endoprosthesis may function without any problems over the period of a few decades and they do not cause any pain. However, this type of prosthesis is not of first choice in elderly patients. Two basic disadvantages of total hip arthroplasty in elderly patients with femoral neck fractures include: high instability of the endoprosthesis, i.e. tendency to dislocations, which requires special caution during movement and changing of body position, especially within the first three months following surgery, and larger intraoperative bleeding as well as prolongation of the surgical procedure by necessary preparation of the acetabulum for implantation. An additional, extramedical disadvantage of the total prosthesis includes the high cost of the procedure (7, 8) (fig. 4). Fig. 4. Total cementless arthroplasty of the right hip without in femoral neck fracture – postoperative radiogram. With so many treatment methods available for femoral neck fractures in elderly patients, it should be emphasized that the optimum management should be individually selected for each patient. However, the most frequently chosen method of treatment of femoral neck fractures at the Clinic, due to comfort of the patient, fast return to independence, insignificant perioperative load and low percentage of complications, is bipolar hemiarthroplasty. 1. Kalewski A: Złamania szyjki kości udowej. [W:] Tylman D, Dziak A: Traumatologia narządu ruchu. T. 2, PZWL, Warszawa 1996; 411-475. 2. Heidukewych G: Results of internal fixation of pauwels Type-3 vertical femoral neck fractures. JBJS Am 2009 Feb; 91(2): 491-491. 3. Liporace F, Gaines R, Collinge C, Haidukewych G: Results of internal fixation of pauwels Type-3 vertical femoral neck fractures. JBJS Am 2008 Aug; 90(8): 1654-1659. 4. Laflamme G, Rouleau D, Leduc S et al. : The timed up go test is an early predictor of functional outcome after hemiartroplasty for femoral neck fracture. JBJS Am 2012 Jul; 94(13): 1175-1179. 5. Moore A: The self-locking metal hip prosthesis. JBJS Am 1957 Jul; 39(4): 811-827. 6. Taylor F, Wright M, Zhu M: Hemiarthroplasty of the hip with and without cement: A randomized clinical trial. JBJS Am 2012 Apr; 94(7): 577-583. 7. Ricci W, McAndrew C, Merriman D, Gardner M: What’s new in orthopedic trauma. JBJS Am 2011 Sep; 93(18): 1746-1756. 8. Blomfeld R, Tornkvist H, Ponzer S et al. : Comparison of internal fixation with total hip replacement for displaced femoral neck fractures: randomized, controlled trial performed at four years. JBJS Am 2005 Aug; 87(8): 1680-1688. 9. Bennett C: To ream or not to ream? That is the question: total hip arthroplasty versus hemiarthroplasty for femoral neck fracture. JBJS Am 2011 Sep; 93: 1-3. 10. Hedbeck C, Enocson A, Lapidus G et al. : Comparison of bipolar hemiarthroplasty with total hip arthroplasty for displaced femoral neck fractures: a concise four-year follow-up of randomized trial. JBJS Am 2011 Mar; 93(5): 445-450. 11. Lu-Yao GL, Keller RB, Littenberg B, Wennberg JE: Outcomes after displaced fractures of the femoral neck. A meta-analysis of one hundred and six published reports. J Bone Joint Surg Am 1994 Jan; 76(1): 15-25. 12. Pankovich AM: Primary internal fixation of femoral neck fractures. Arch Surg 1975 Jan; 110(1): 20-26. 13. Sevitt S, Thompson RG: The distribution and anastomoses of arteries supplying the head and neck of the femur. J Bone Joint Surg Br 1965 Aug; 47: 560-573. 14. Crock HV: An atlas of the arterial supply of the head and neck of the femur in man. Clin Orthop 1980; 152: 17-27. 15. Eliasson-Eiskjaer S, Ostgard SE: Survivorship analysis of hemiarthroplasties. Clin Orthop 1993; 286: 206-211. 16. Kreder HJ: Arthroplasty led to fewer failures and more complications than did internal fixation for displaced fractures of the femoral neck. J Bone Joint Surg Am 2002; 84: 2108. 17. Bray TJ: Femoral neck fracture fixation: clinical decision making. Clin Orthop 1997; 339: 20-31. 18. Calder SJ, Anderson GH, Jagger C et al. : Unipolar or bipolar prosthesis for displaced intracapsular hip fracture in octogenarians: a randomised prospective study. J Bone Joint Surg Br 1996; 78: 391-394. 19. Cornell CN, Levine D, O’Doherty J et al. : Unipolar versus bipolar hemiarthroplasty for the treatment of femoral neck fractures in the elderly. Clin Orthop 1998; 348: 67-71. 20. Bout CA, Cannegieter DM, Juttmann JW: Percutaneous cannulated screw fixation of femoral neck fractures: the three point principle. Injury 1997; 28: 135-139. 21. Bonnaire F, Schaefer DJ, Kuner EH: Hemarthrosis and hip joint pressure in femoral neck fractures. Clin Orthop 1998; 353: 148-155.